Tim from Palm Tree Lagoon and his friend Micky visited the Maeklong River in Amphawa on a short one day stingray fishing trip. After placing baits at various points across the river the anglers waited for the incoming tide. With the tidal river quickly rising it was not long before one of the baits was picked up. It soon became apparent that the Giant freshwater stingray was a large fish as it slowly towed the boat upstream. The battle continued for almost an hour before the hook broke and the stingray was gone. After regaining their composure the anglers began fishing again. Very little happening in the convening hours until a slow determined take saw the angler connected to another stingray. The battle on this occasion only lasted twenty minutes and saw Micky bringing the Giant freshwater stingray off the bottom several times before netting. 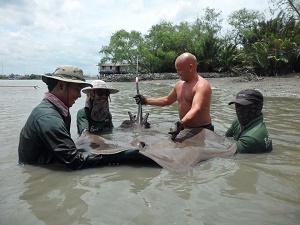 The Giant freshwater stingray was estimated to weigh 90kg and was quickly released after a few trophy shots. The anglers received no further action for the rest of the day before fishing came to an end.